We went with some friends a month ago to visit to a community of about 5,000 people back east. We were arrested upon arrival. And we were shot as we left. We’re okay, all of us. But we’re not going to forget what happened to us. Actually, the bigger problem is trying to REMEMBER all of the things that happened to us. You might think we’d be glad to be out of the place. In truth, however, we’d go back in a heartbeat. We’d go back because we were surrounded by incredible people, all of whom were focused on making their community the best in the world. Every single one of the 5,000 had that goal. Everything they did was focused on the productivity of 4.5 acres. The average age of this community is less than 25 with many of the most important jobs done by people who are 18, 19, or 20. This is the USS Theodore Roosevelt, 92,000 tons of sovereign United States Territory wherever it goes. 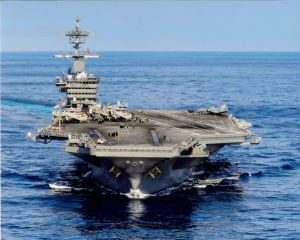 Its twin nuclear reactors recently refueled, the latest electronic gear installed, and the most recent updates available built in, “The Big Stick” is described as the “Corvette” of America’s aircraft carrier fleets. The USS Theodore Roosevelt can launch and land more airplanes in a few hours than dozens of nations have in their entire air forces. It’s a city that can go 35 miles per hour. It has its own daily newspaper, television station, a Starbucks, restaurants that serve more than 18,000 meals a day, a distillation plant that daily turns 400,000 gallons of the ocean into drinking water, the head of a moose shot by President Roosevelt, and an airport that houses St. Louis-made airplanes that can be armed to the teeth and go airborne at the rate of two per minute. It’s twenty stories high, not counting the forty feet that’s below the water line. It is majesty and menace, depending on whether you are friend or foe. A rational person seeing the Roosevelt understands it is much better to be the former. Military transport planes have few luxuries. 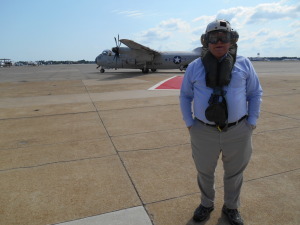 I say “few” because for this trip we were not in the sling chairs that have been in the C-130s we’ve taken to submarine events. The Greyhound seats were utilitarian, did not recline and did not have trays. But at least they were seats. They faced to the rear of the plane. 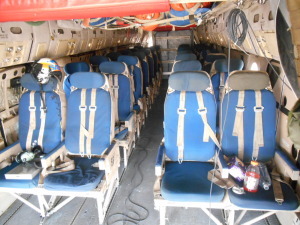 There’s no sound-deadening insulation in military cargo planes. Pipes and cables and tubes and support structures are left uncovered and sometimes the overhead is pretty low. And that is why they issued everybody something called “cranials” so we wouldn’t damage the airplane with our foreheads. 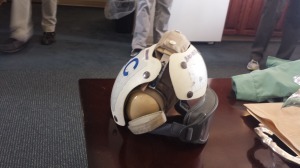 They’re kind of like the catchers’ masks and hats that Yadier Molina and Salvador Perez wear for the Cardinals and the Royals but they’re not nearly as fancy and don’t have masks. But they did have goggles–which rather quickly fogged over for me when I got into the plane. This is what the well-dressed Greyhound rider looked like that day. They also issued each of us a life vest since Greyhound seat cushions aren’t intended to be flotation devices. And earplugs. Anytime we wore a cranial on this trip we also wore earplugs. Although these funky helmets had ear-protecting headphones built into them, secondary protection was needed. The un-muffled turboprop engines of the Greyhound were still loud but at least were tolerable during the flight out. Later, on the flight deck, with F-18s of various configurations landing and being launched within yards of us, the double protection was barely adequate. The pilot told us he has to take an airplane with an 80-foot wingspan and put it down in a space that is 85 feet wide on a landing strip that is moving away from him at a speed of at least 25 knots and is not stable. The Greyhound has only two windows in the passenger/cargo area and they’re toward the back. So almost all of us were sitting in the dark wearing life vests and cranials and goggles, flying backwards tightly strapped with a four-point harness into our seats. We flew for about an hour and a half. We didn’t land. We stopped. The fog that you see in the video is the condensation from the Greyhound’s air conditioning system. WHOMP!!! and four or five G’s pressed us back into our seats for two seconds as we went from 120 knots (138 mph) to 0 knots when the tailhook grabbed the arresting cable..
That’s us in our COD, snagging the three-wire. 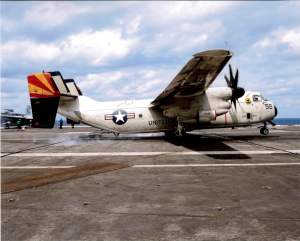 By the time the brain processed what had happened, we were moving again and the rear cargo gate in front of us started to come down, revealing about 400 feet or less of carrier deck and miles of gray ocean. Three or four seconds into the visit, we already were on sensory overload. And we remained in that state for almost twenty-four hours. We had been out of the COD and inside the ship for only a short time when General Quarters was called. Everybody was mobilized. It may have taken a while in production however well worth the wait. Both very profession and well written. Thanks for taking, of your valuable time, to continue your interest in our great operational navy. As usual a beatiful piece of writing. Can not wait for the next chapter. Man, am I envious!